JOHN E. WELSHONS (“Ramananda”) is a highly respected contemporary spiritual teacher who lectures and leads meditation courses throughout North America. He has been a practitioner of vipassana (mindfulness) meditation and various forms of yoga for more than forty years. In addition to his latest book, One Soul, One Love, One Heart: The Sacred Path to Healing All Relationships, he is also the author of Awakening from Grief: Finding the Way Back to Joy and When Prayers Aren’t Answered, two books that emerged from nearly forty years of experience helping people deal with dramatic life change and loss. John has studied world religions throughout his life, and holds a B.A. in Comparative Religions from the University of South Florida, and an M.A. in History of Religions from Florida State University. He has also traveled and studied extensively in India. He is a gifted counselor and teacher who has worked closely with Ram Dass and Stephen Levine and trained with Dr. Elisabeth Kübler-Ross. Sometimes paths of Destiny intersect in unusual ways. It must have been a beautiful sunny warm day in Maui with ocean breezes and the joy of being in the company of amazing souls. My beloved friend, Mary Omwake, was having lunch with a group of people, all friends of Ram Dass, all participating in the ritual of the beach, potentially a swim, time together and good company. 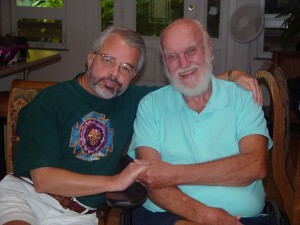 Ram Dass, Roger Walsh and Mary were all sitting at the lunch table and somehow decided to call me on a cell phone. We talked about when Ram Dass came to Unity of Tustin not too long after his stroke, with me telling him that his ‘silence’ at Unity wouldn’t matter…we would simply ‘surf the silence’ with him. It was a conversation of pure love. Overhearing the conversation from the edge was John Welshons… That was the beginning of what has emerged as a deep and beautiful life transforming dialogue during one of the most difficult times of my life. There is a little-understood teaching: ‘You must die before you die’. In my life, one life ended and another life was giving birth.